Watch this 10-minute video intro to learn more about the new Short-Term Home Health Care policy offered by Guarantee Trust Life Insurance Company. In addition to the information on this page, we make available access to sales training webinars and special marketing material. This is made available to agents appointed through our organization. #2 – Call 818-597-3205 or E-Mail us now. Click to Email us: Tell us you want to start selling GTL’s Short-Term Home Health Care. Free for agents appointed to offer GTL’s Short-Term Home Health Care policy. Three (3) 20-minute webinars focused on successfully marketing and selling the GTL HHC policy. Presented by Jesse Slome, STC Industry leader. Each webinar provides insights, practical tips and real marketing and sales strategies that work. IF YOU ARE NOT ALREADY APPOINTED WITH GTL – we invite you to participate. IF YOU ARE ALREADY APPOINTED – please contact your General Agency for product and sales information on the GTL product. If you are not already appointed with GTL and would like to BE PART OF THE GTL WEBINAR TRAINING. #1 – Check the State Listing Below (to see if the policy is available in your state. #2 – E-Mail us now (share your name, State and your phone number). Click to Email us for Webinar access: Share your name, state and a phone number. Updated November 28, 2017. Subject to change. 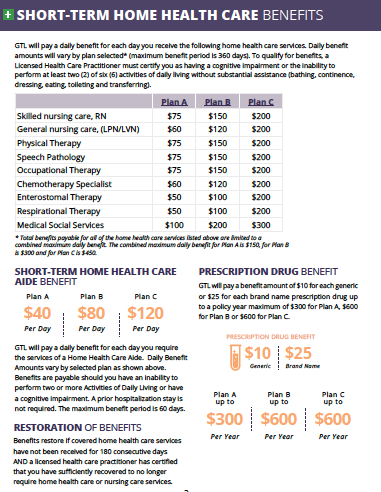 BENEFITS FOR UP TO 360 DAYS: The policy offers several benefits and features that we find attractive for consumers who may have care needs and want benefits — at least for 1 year (360 days). While Medicare covers services like physical or speech therapy, they often require an individual go to an approved facility for care. That is not always desirable or feasible. Individuals can utilize the benefits of this policy to receive skilled care services in their own home. This is a highly attractive benefit. Plus, the policy provides three options (levels) for these benefits. Choice is always a benefit for your clients. HOME HEALTH CARE AIDE: Any agent who has (or is) selling long-term care insurance knows individuals want the option to receive care services in their own home. This policy will pay for the services of a Home Health Care Aide. During our agent training we address why the 60-day nature of this benefit can be significantly valuable to individuals. And, don’t forget about “No prior hospital stay”. PRESCRIPTION DRUG BENEFIT: This is a real benefit for seniors who often take multiple medications. They can receive the benefit even if they paid NOTHING for the medicine (meaning it was covered by their Medicare Advantage or Medicare Part D plan). The client can choose a $300 annual benefit or a $600 annual benefit. This is a significant benefit for seniors who take multiple prescription medications! SIMPLE APPLICATION WITH 2 YES-NO HEALTH QUESTIONS: Okay, there’s an option (Option C) that requires completion of a third Yes No question. APPLICANTS UP TO AGE 85: Applicants accepted from age 40 to age 85. This is an ideal option for individuals who can not health-qualify for traditional long-term care insurance BUT still want some potential coverage (especially care at home). It’s also a great complement for those who have Medicare Advantage and Medicare Supplement coverage. During our agent training we explain far more about how this product dovetails with these common coverages. To learn more about this product you should read and request the policy specific information and outline of coverage. Policy provisions can vary by state. 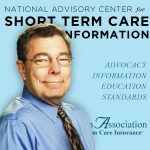 Our focus is advocating for the benefits offered by short-term care insurance (recovery care) products such as the Short-Term Home Health Care policy offered by Guarantee Trust Life Insurance Company as well as other insurers.